Boy Scouts from Troop 373 visited the Greenville City Council chamber to learn more about local government. GREENVILLE — Water was the main topic of discussion at the Greenville City Council meeting Tuesday evening. The council’s utilities committee submitted a report in which it advised against moving forward with the construction of an additional water tower for the city. “It is the recommendation of the Members of the Utilities Committee not to move forward with the water tower project due to funding issues and the possibility of the City losing a substantial amount of money required for the preliminary stages of the project if the [Environmental Protection Agency] were to decide the funding was not available and pull out of the project,” the report stated. Currently, the city has two water towers — one holds 1 million gallons, the other a half million. In the event of a catastrophic event in which water was no longer able to be pumped, it is estimated the city would have approximately 12 hours of water available, only half of the EPA’s recommendation. The cost of a new water tower, designed to hold either 1.5 million or 2 million gallons, is estimated at more than $6 million. Costs for the engineering design phase were an estimated $164,000 — money which the city would lose if EPA funding was not granted. The committee also recommended that the city move forward with monthly billing (a change from the current quarterly billing) and a new water rate structure for city residents. While there appeared to be little opposition to the change from quarterly to monthly billing, some members of council balked at proposed rate hikes as well as a move to charge $50 to shut off or start residential water service. The current cost for shut down and start up is $20. Ultimately, council decided to delay approval of the committee’s report until a work session can be scheduled to discuss the issues raised. Among other business, council approved an ordinance suspending yard sale regulations for Aug. 6-9, in support of the “World’s Longest Yard Sale” event. Greenville residents are currently granted permits to conduct two residential sales per year at no cost. Participating in the event will give households a third opportunity. Council voted to approve a resolution to accept a bid — the only one received — from Walls Brothers Inc., for maintenance and paving of city streets. The bid price was $329,742.19. 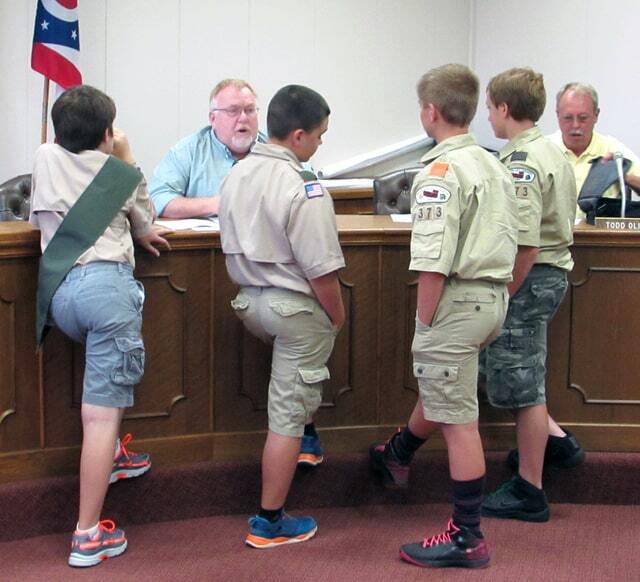 Council members also welcomed a group of Boy Scouts from Troop 373 and their scout leader Ken Livingston to observe the workings of city government. The Greenville City Council meets the first and third Tuesday of every month on the second floor of the Greenville Municipal Building, 100 Public Square. City residents are encouraged to attend.